PABLO Picasso once said: "Every child is an artist. The problem is how to remain an artist once we grow up." Vanessa Porter is one of the lucky few. She was told her whole life she couldn't be an artist, but after a lifetime of hard work and self-belief, she proved her critics wrong. Growing up in Cronulla in Sydney during the Puberty Blues era of the late '70s and early '80s, the dream of becoming an artist didn't sit well with her practical father. Pushing her so-called unrealistic dream and very real talent aside, Vanessa listened to her father's advice and started a TAFE course in secretarial studies straight after school. "It was something my father said I could always fall back on," Vanessa said. "However, I completely sucked at that and the art world beckoned." With art in her blood and painting on her mind, Vanessa soon discovered creativity was just intelligence having fun. And that's exactly what she did. Had fun. Vanessa spent the next 25 years working within the industry she loved - practically, of course. After having a family, she worked in fine-art supplies while studying art part-time at TAFE. "I was very fortunate to have a mentor through this period who taught me everything I know about painting and art," she said. When the global financial crisis hit, Vanessa's job went from full-time to part-time. For what was a phase of insecurity and fear, something beautiful and fulfilling was born: Pepi Wren. "Pepi was my first dog and Wren was the name of the first street I lived on," Vanessa said. But Pepi Wren was many more firsts for Vanessa. It was her first business, first artist name and first chance to turn that unrealistic dream into a very real life. However, the problems of remaining an artist as a grown-up continued. Juggling part-time work as well as her own art business wasn't easy. 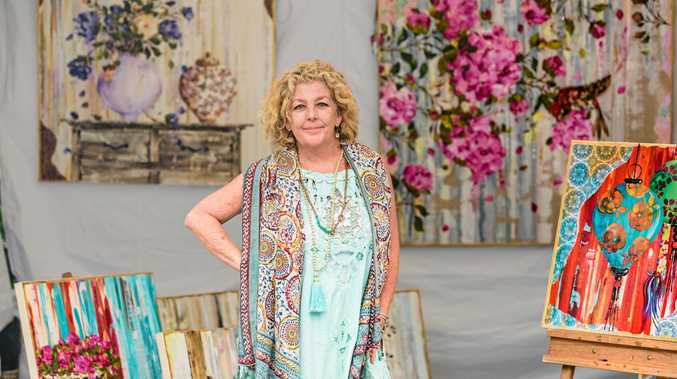 From the time producing her artwork to selling them at the Original Eumundi Markets and all the other business bits in between, Vanessa thanked her dad for putting her through secretarial school after all. But it was her next business move that took Pepi Wren to a new level. Vanessa left her part-time job. "It was a huge step, and with the support of friends and family who encouraged me, I have never looked back," she said. "The career advice I've taken over the years and the things I tell myself everyday are: work hard, surround yourself with positive people, listen to those people and always believe in yourself. "My inspiration comes from passion and my passion comes from nature and life." Today, Pepi Wren brings a burst of happiness, colour and passion into the lives of all who walk into Vanessa's store at the Original Eumundi Markets. "I hear so many beautiful stories from people who have purchased my artwork," Vanessa said. "I'll never forget a lady whose husband was in the armed forces and he had sadly passed away. His call sign was hummingbird. 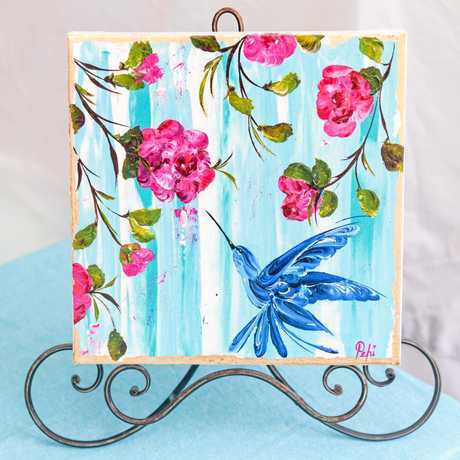 "So when she saw one of my paintings of the hummingbirds, it gave her such happiness she purchased it. "It was a sign to her that he was with her. "It's very humbling to hear these stories. "I'd like to believe my artwork finds the person."